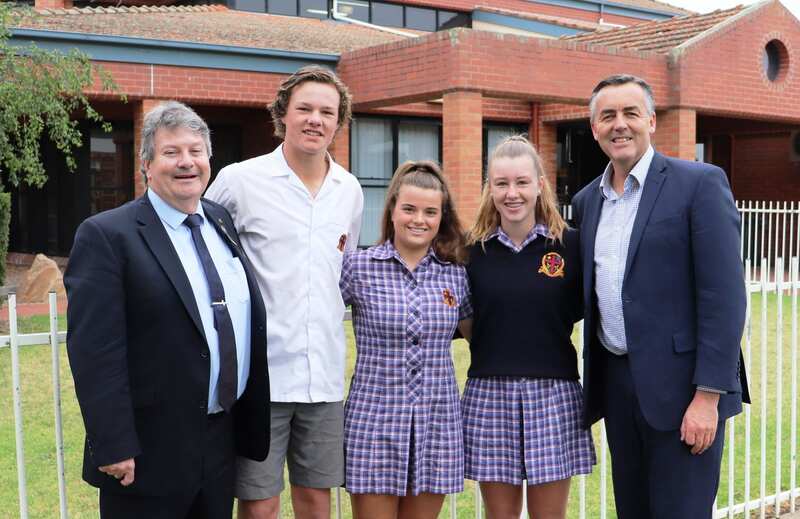 Federal Member for Gippsland Darren Chester (right) pictured with Catholic College Sale Principal Chris Randell and students Noah Hurley, Taryn Grubb and Lilli Stobie at the announcement of $1 million in Federal Government funding to build a state-of-the art years seven-eight block ahead of the relocation to one campus. A multi-million dollar redevelopment will provide years seven and eight students at Catholic College Sale with purpose-built, state of the art learning spaces. The Nationals Member for Gippsland Darren Chester has announced $1 million from the Federal Government, matched by $5 million from Catholic College Sale, to redevelop the old John 23rd building with access to the latest teaching resources. The building will house years seven and eight students when they move from Sion to the St Patricks campus at the end of 2020. “Students and teachers thrive when their schools have modern facilities and can use the newest technology,” Mr Chester said. “The funding will provide new classrooms, together with filming and communications resources, wet areas for scientific experiments and large gathering spaces designed to provide the best possible opportunities for local students. Mr Chester said the funding was being provided through the Capital Grants Program, which funds new facilities in schools that may not have the capacity to fully self fund. Catholic College Sale Principal Chris Randell said it was an exciting time in the school’s history. “The move to one campus, and the educational benefit that will come from those efficiencies, means we can provide our students with access to the best possible learning environment and give our students every advantage,” Mr Randell said. “Having secured the Federal Government funding, this multi-million building project will commence in the middle of next year and take around 12 months to complete.